The last I saw of Mina, she was jubilantly watching the arrival of a helicopter to rescue her from the confines of Mysterious Island. A boating accident landed her on this isolated and hidden isle some time ago. Cut off from all communication with the outside world, she survived using her wits and benefited from the friendship of a monkey named Jep. But now, finally, she is able to go home. 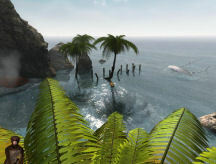 While the game is set on the same island as the first, many of the old, familiar locations are now underwater. 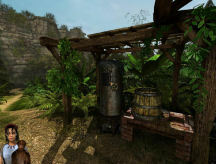 The gamer will revisit a few of the areas from the original game, but mostly you will explore new territory. Along the way, you’ll discover fresh information about the various folks who made this place their refuge in times past. The graphics are beautifully done. Small animations provide an ambiance that feels authentic. The outdoor settings are lush, detailed, and beautifully lit. At times my eyes almost hurt from the brightness of the sun as I panned toward it. Shadows are deep and clearly delineated. Light becomes filtered when you move inside a building and, of course, darker and uneven when underground. I particularly enjoyed the way the scenery wavered slightly when underwater. It felt real. Two types of cut scenes provide a reward for puzzle solving. Often, progress was shown using graphic novel panels (like the first game), but now and again, the gamer is rewarded with a cinematic cut scene. Both worked equally well. Layers and layers of sound combined to immerse me in the game’s atmosphere. For instance, in one area I heard a singing bird to my left. A bit further away I heard the thump-thump of a windmill and fainter still, the ocean’s roar. Closer and to my right was the whack-whack of rock hitting stone as a monkey used it to open nuts. I was surrounded by the sounds of the island. From time to time, music filled the air, alternately creating tension or inducing relaxation, whichever was appropriate to the moment. 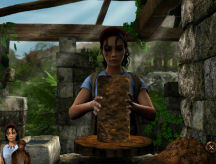 Though the game is played in first person, we do see Mina and Jep from time to time. I love the way the artists portrayed Mina as a strong woman, yet you can see some vulnerability in her eyes. No Barbie doll here -- Mina has reasonable proportions and sensible clothing. She even has freckles. Jep does a great job of displaying emotions through his facial expressions and his body movements. Watching him run around with a flower behind his ear was a hoot. Both are playable characters, with their own strengths and weaknesses. Jep is the more agile and can go places that Mina cannot easily access, while Mina can combine items but Jep cannot. Together they make a great team. Since they are alone on the island, there is very little dialogue. Mina does talk to Jep, but there are no long conversation trees. 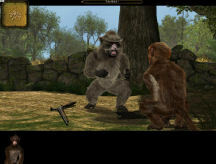 He communicates with her (as well as with a few non-player characters) utilizing a pictorial menu. Mina’s chatter occasionally provides a slight hint as to what the gamer needs to do next. Her voice is just exactly as I’d imagine it, so kudos to the voice actor who brought Mina to life. Mina and Jep’s first challenge is to survive while once again awaiting rescue. Food, drink, and first aid supplies all must be found or created. A happiness/energy gauge for each reveals their current state. For some tasks you need to raise this from orange to green. Usually, it was fun finding creative ways to improve their outlook, but sometimes it seemed tedious. Also, they must deal with hostile fauna, and avert a looming catastrophe. To do so, they use all manner of items that they find or make. As Mina, you combine bits and pieces in the inventory to create just the right tool for the job. After this game I’ll never look at ants the same way again. But concern for their physical wellbeing is soon submerged beneath a much larger and more dangerous threat. As their struggle continues, the story twists here and turns there and, in the end, just might surprise you. The puzzles are well integrated into the storyline, and some have alternate solutions. Many are inventory based, but not all. There are several musical puzzles that require the gamer to reproduce three to five tones. Musical puzzles are the bane of my existence. I cannot do them, and these were no exception. However, I was able to continue progressing through the game by consulting a walkthrough for these particular stumbling blocks. There are also several sequences that require you to use precise timing to accomplish a task. I did not find these difficult and think that most people should be able to do them without a problem. In addition, there is one in which Jep will have to catch objects thrown to him. After a few failures, it is possible to make completing these challenges a bit easier if desired, though it will cost you a few points. Additionally, Mina has a few logic puzzles to solve. Most of them I enjoyed, though there was one I’d never have worked out on my own. Twice in the game, a particularly bothersome monkey will attempt to pick Mina’s pocket. Quick clicking will forestall him. I wasn’t fast enough and he got away from me with some goods. So, on my second playthrough, I saved just before his appearance and then just kept reloading my save until I finally vanquished him empty-handed. I don’t believe he can take anything that will stop your progress in the game, but I wasn’t willing to take a chance. A point system lets you track how well you are doing and might provide incentive for a replay. There are no sliders, mazes, or color dependent puzzles. RTMI2’s interface is mouse-controlled, intuitive, and easy to use. Most functions are accomplished with a left click. The smart cursor changes to indicate which actions are available, and which direction Mina/Jep can move. The right mouse button opens the inventory area. From there you can access the main menu (save, options, etc. ), the gallery (video and graphic novel type cut scenes), goals (general in nature and checked off as completed), or review a record of the dialogue. The game uses 360 degree panning, but the speed is adjustable. I set mine to slow. My favorite feature, though, is the shortcut button, which becomes available partway through the game. It allows Mina/Jep to travel from one location to another instantly, thus making to-and-fro much less stressful. Saves are at will, and unlimited. They are identified by date/time and a nice-sized picture. The game is Alt+Tab friendly and subtitles are available. In addition, background music, voice, and sound effects volume are all separately adjustable. Seven inventory pages is a gracious plenty and allows gamers to organize the found or created odds and ends to their own liking. Though Mina is resilient, making the wrong move can spell the end for her in a couple of situations. The same is true for Jep. Thankfully, you are given as many chances as you need to succeed in these scenarios and if you annihilate one of them, the action starts anew at the beginning of that sequence. 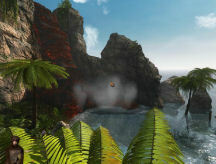 A tutorial is available if desired, as is a summary of the events found in the preceding game, Return to Mysterious Island. About halfway through the game, I became stuck. I revisited areas, I switched players, I wandered around aimlessly, I sent prayers up, and then finally in desperation, turned to the internet. There I discovered that I had encountered a game-ending glitch. My mistake occurred early in the game when I used all the clay in my inventory while making vases. Thus, when I needed clay to solve a puzzle which cropped up much later in the game, I didn’t have any. I was not concerned and just headed back to pick up some more. Sadly, RTMI2 would not allow me to do that. I could go to the spot, and stand on the clay, but I could not pick it up. Pestiferously, I was forced to start anew from the beginning. Kheops has since released a patch to correct this. It’s available here. However, the patch did not work with my in-progress game. Other than this, the game was stable and ran without incident. Though at times I tired of trying to keep Mina and Jep happy, on the whole I enjoyed Return to Mysterious Island 2: Mina’s Tale very much. The puzzles kept my interest. The surroundings were immersive. The sound work was excellent. The story threw in an unexpected twist, and the interface was easy to use. Except for the glitch (and that is a big exception), RTMI2 provided me with many hours of entertainment.